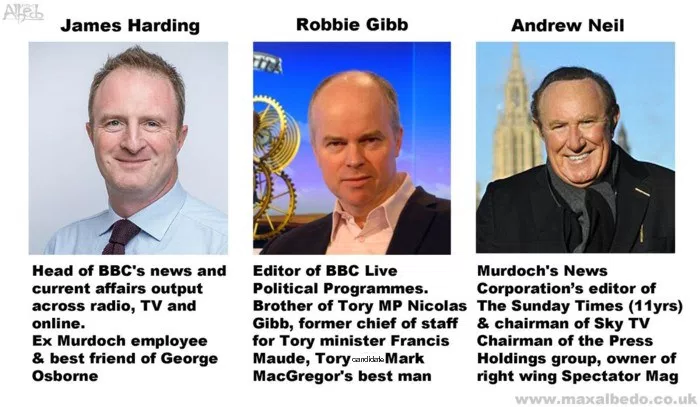 Some of the BBC’s most prominent political editors during the 2010–2017 era of Tory governance have close ties to the party and to right-wing media organisations. Image source: Max Albedo. The public broadcaster often comes under fire from both the left and the right for its lack of neutrality, but is its analysis of politics fairly balanced? Left-wingers often accuse the BBC of right-wing bias. Right-wingers often accuse it of left-wing bias. This isn’t usually helpful, and in general, the BBC has done a pretty decent job of maintaining balance, despite the difficulty of ensuring such balance. I am therefore writing about this issue with a dose of hesitance. Whilst it’s probably fair to say that the BBC gives generous coverage to progressive social ideas, such as issues surrounding equality of many different types, economically it remains very much a supporter of the status quo or very nearby ideologies, i.e. a mish-mash of classical liberalism and neoliberalism, with social democracy being about as far left as it considers giving airtime. The 30–45 minute daily current affairs analysis programme Newsnight, which Neil occasionally also presents (but which otherwise does a good job of remaining neutral, and is normally presented by: Kirsty Wark, who allegedly has ties to the Labour Party but no professional history of working for biased publications; Emily Maitlis, who formerly worked for The Spectator; and Evan Davies, an economist who supported the SDP as a student and now has no political ties). James Harding, the former editor of The Times and a close friend of former chancellor George Osborn, was Director of BBC News until 1st January this year. Former chairman of Sky TV, part of Murdoch’s News Corporation, which also owns The Times, a conservative publication, and The Sun, a right-wing tabloid. When editor of The Times, Neil employed prominent Nazi apologist David Irving, who the previous year had been convicted of Holocaust denial, to translate excerpts from Goebbel’s diary for publication in the newspaper, despite a book deal for the full translation having fallen through due to Irving’s “selective” editing of it. On air, Neil often manages to subdue his female guests, and he has been accused of misogyny by Tory guests, as well as more left-wing ones. During the general election campaign last year he got away with wearing a tie on air that was covered with the logo of the Adam Smith Institute, a neoliberal think tank and lobbying group. Joined on his BBC show everyday by a Labour MP and a Tory MP, his show is demonstrably biased in favour of neoliberal and centre-right viewpoints. It was edited until 2017 by Robbie Gibb, a former advisor to two Tory MPs and now Director of Communications at 10 Downing Street under Theresa May. All BBC political presenters and editors should at least have no current affiliations with political parties or other media companies, and preferably have little to no history of working for a biased news publisher. In cases where presenters do have such previous affiliations, there should be a much fairer distribution of viewpoints. There must be a much fairer balance of guests with varying viewpoints. One Tory plus one Blairite is not balance. One classical liberal plus one neoliberal advocate is not balance. Over-representation of libertarian advocates, such as Kate Andrews from neoliberal think tank Institute of Economic Affairs, or spokespersons from low-tax pressure group TaxPayers’ Alliance, without balance from far-left equivalents challenging the ideology of privatisation and deregulated free-market economics, is not the impartiality or neutrality that the BBC is supposed to offer. Representatives from the centre-left are only slightly represented and the far-left is almost totally omitted from BBC political programmes, whilst divisive far-right figures such as Nigel Farage and formerly even Nick Griffin receive airtime.